Being able to create a Scheduled Task for a svMotion for several guests from a PowerShell script, instead of clicking away in the vSphere Client, would be another step on the path of vSphere automation. The current PowerCLI 4 (build 162509) unfortunately has no cmdlets for Scheduled Tasks. But the SDK contains the CreateScheduledTask method that can be used for this purpose. The key parameter to this method is the ScheduledTaskSpec object. In the action property of this object you specify which type of action you want the scheduled task to take. If we want to schedule a Task, we will have to select the MethodAction extension object. But then it looks as if we’re stuck. The SDK Reference doesn’t say which are the accepted values for the name property in the MethodAction object. Luckily, with a bit of reverse engineering and with the help of Fiddler (see my The Onyx alternative ? post), I was able to get the accepted values for the name property. In fact the set up is quite straightforward, the name property holds the name of the SDK method that performs the type of task requested. And the argument property, which is an array, will hold all the parameters that go with the called method. We want to “Migrate a virtual machine” and move the VM to another datastore. That means we need the RelocateVM_Task method. This method requires 2 parameters. The following table shows which SDK method corresponds with which Task. With the name of the SDK method you can find the parameters that need to go in the MethodAction.argument property. The Virtual Machine names come from a CSV file with 1 column and with the header VMname. As Ryan asked years ago, how can we check if the task already exists and in case remove/edit it? I tested it and it works fine for powered off VMs. My only trouble is: it looks that VMware.Vim.VirtualMachineRelocateSpec always creates a task to change either datastore and host; if I don’t specify anything the current host is kept. If the VM is powered on the task attempts to change the host instead of changing the datastore. How can I specify that I want to change only the datastore? In the $arg1.Value you are in fact creating the VirtualMachineRelocateSpec object. In the script I used datastore, pool and host. Did you already try by just entering the datastore ? My only concern is that when I review the scheduled task created with the script I see that “Change both host and datastore” is selected, while I want only to change the datastore. 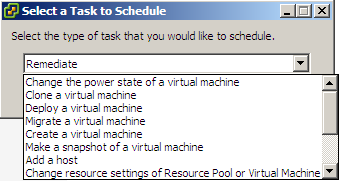 Only one task for first VM from CSV created. Thanks Luc for this great script! I would like to use this script to convert Think to Thin disks. How can I do this? I am running ESXi v5 and thank you. I was getting this error too when I found something out. The time that’s entered in the script is in UTC time!! So make sure you’re accounting for that in the time settings of the script. So if you want it to execute 5 minutes from now add 8 hours and 5 minutes from now and enter that time in the script. Luc, how would you check if the task already exists and if so reconfigure the existing task? Or, delete the existing and create a new one? I figured it out. I had entered the time format incorrectly (9:30 vs 09:30). And as always, great script Luc! Hi Jeff, thanks for figuring it out. Luc, Looks like this is some great code… I am having trouble with it though. Geting this error. Any thoughts?